^ a b Bowers and McDowell 1993, p. 63. ^ Bowers and McDowell 1993, p. 62. ^ Franks 2004, pp. 19, 66. ^ Cooksley 1991, p. 23. ^ Robertson 1970, p. 59. ^ Franks 2004, p. 19. ^ a b Connors 1975, p. 50. ^ a b Franks 2004, p. 50. ^ a b Davis 1999, pp. 70–71. ^ a b c Davis 1999, p. 72. ^ a b c Mason 1992, p. 61. ^ Davis 1999, p. 76. ^ a b Robertson 1970, p. 157. ^ Franks 2004, p. 9. ^ Franks 2004, p. 22. ^ Franks 2004, pp. 54, 68. ^ Franks 2004, pp. 62–63. ^ Franks 2004, pp. 21, 69. ^ Kennett 1991, p. 98. ^ Franks 2004, p. 68. ^ Lamberton 1960, p. 74. ^ a b c Franks 2004, p. 76. ^ Franks 2004, p. 69. ^ Franks 2004, pp. 13, 69. ^ Franks 2004, pp. 46, 49, 56–57. ^ Franks 2004, p. 17. ^ Davis 1999, p. 75. ^ Thetford 1994, p. 312. ^ Bruce 1990, p. 19. ^ Hiscock 1994, p. 30. Bowers, Peter M. and Ernest R. McDowell. Triplanes: A Pictorial History of the World's Triplanes and Multiplanes. St. Paul, Minnesota: Motorbooks International, 1993. ISBN 0-87938-614-2. Bruce, J.M. Sopwith Triplane (Windsock Datafile 22). Berkhamsted, Herts, UK: Albatros Productions, 1990. ISBN 0-94841-426-X. Connors, John F. "Sopwith's Flying Staircase." Wings, Volume 5, No. 3, June 1975. Cooksley, Peter. Sopwith Fighters in Action (Aircraft No. 110). Carrollton, Texas: Squadron/Signal Publications, 1991. ISBN 0-89747-256-X. Franks, Norman. 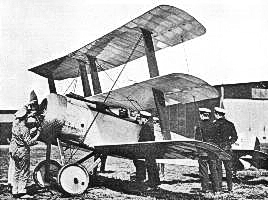 Sopwith Triplane Aces of World War I (Aircraft of the Aces No. 62). Oxford: Osprey Publishing, 2004. ISBN 1-84176-728-X. Hiscock, Melvyn. Classic Aircraft of World War I (Osprey Classic Aircraft). Oxford: Osprey Publishing, 1994. ISBN 1-85532-407-5. Kennett, Lee. The First Air War: 1914-1918. New York: The Free Press, 1991. ISBN 0-02917-301-9. Lamberton, W.M., and E.F. Cheesman. Fighter Aircraft of the 1914-1918 War. Letchworth: Harleyford, 1960. ISBN 0-90043-501-1. Robertson, Bruce. Sopwith – The Man and His Aircraft. London: Harleyford, 1970. ISBN 0-90043-515-1.